Friedman is the deputy director of ClimateWire, a news service that brings readers daily information related to climate change and its effects on business and society. At the launch of ECSP’s new report, Backdraft: The Conflict Potential of Climate Mitigation and Adaptation, Friedman discussed her experiences reporting on climate-induced migration in Bangladesh – one of the most vulnerable countries to climate change in the world, due to its low-lying geography, dense population, and high poverty levels. Although climate migration is often characterized as primarily involving the crossing of international borders – Bangladeshi migrants pouring into India, for example – internal movements within a country can strain already burdened infrastructure, give rise to urban slums, and increase the potential for domestic conflict. 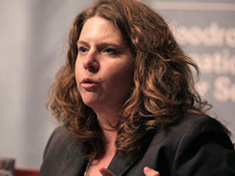 Friedman spoke at the Wilson Center May 16.